Finally IHS has released the cost breakdown of Apple’s latest and very first Apple Watch. The research firm has focused on the 38mm Apple Watch Sport model (cheapest one) and gives a final cost price of $83.70. Cheap, aint it? Tim Cook warned us during the Apple’s earnings call that the cost of Apple devices shared by research firms are nowhere “close to being accurate.” While we trust Tim, it is already established that these cost breakdowns don’t actually try to give the final cost of the gadget and instead focus purely on component cost – never including how much R&D, marketing and many other similar processes would have costed the company. Coming back to Apple Watch teardowns, we most certainly loved the iFixit Apple Watch teardown that took us on such an awesome watchmaking journey. There is some beauty of its own to see tiny gadgets getting reverse engineered – sort of. 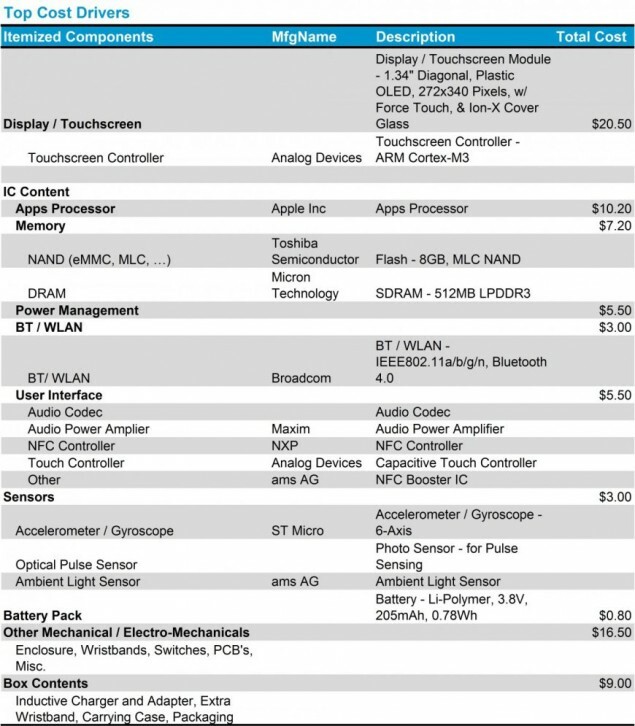 Preliminary estimate shows Apple Watch Sport hardware costs onlyabout 24 percent of MSRP; lowest of any Apple product examined by IHS. However, Luca Maestri, Apple CFO had claimed that the margins on the Watch are actually lower than the company’s other products. This could be possibly because of the immense amount on R&D, we suspect.